After giving this distro a few days of use, one word comes to mind: "polished." Pardus 2008 is a Linux distribution created by the Turkish National Research Institute of Electronics and Cryptology. At its core, it is a Turkish language OS, but the English version shows no lack of attention. It is a KDE-based distribution, and while I'm not a KDE fan myself, the ease-of-use of this interface blew me away. It is clear that a lot of attention went into making almost every aspect of the system professional and easy to use. I typically don't judge an OS based on how easy it was to install - some users may never have to go through this step. 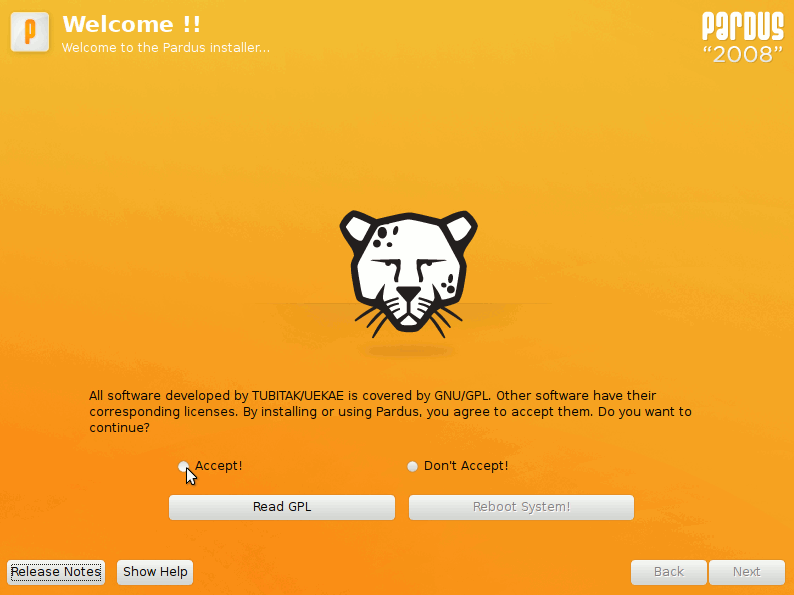 Pardus does not offer a Live CD, to try out the system before you install, so I had no idea what to expect. However, the installation was easy enough to complete. I was a little thrown off at the beginning - the installer started in Turkish - but English was just a key press away. You are then immediately greeted with a GPL license agreement (above) followed by the standard installation steps: timezone, user information, and partitioning. The partitioner was simple enough to use, offering to automatically partition your drive if wanted. A page appears allowing you to create as many users on the system as you want, right from the start. It also allows you to set any of them as system administrators, but get this: the next page also asks for you to set a root password. I don't like enabling root access on a machine, but it does have its uses. However, if I've given someone system administrator privileges on the previous page, why should I have to define a root password as well? After those steps are completed, Pardus begins to install the system to your HDD. One minor problem that irked me was the progress bar: it would take 10 minutes to reach 100%, but then it jumps back to 0% to configure installed packages. It doesn't affect anything, but it can be a little confusing/annoying. Then again, what installer in the world actually has a working progress bar? Once installed, the system restarts and loads the Pardus-customized GRUB. You don't get a standard black-and-gray bootup menu, but rather a less scary Pardus-themed menu. It may be a small customization, but it is a big feature in terms of usability. The system continues to boot with a Pardus splash screen and login screen. 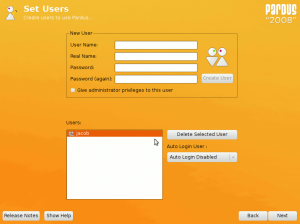 The login allows you to visually select what user to sign in with. Even though the root user is able to log in, it is at least hidden from the user here. 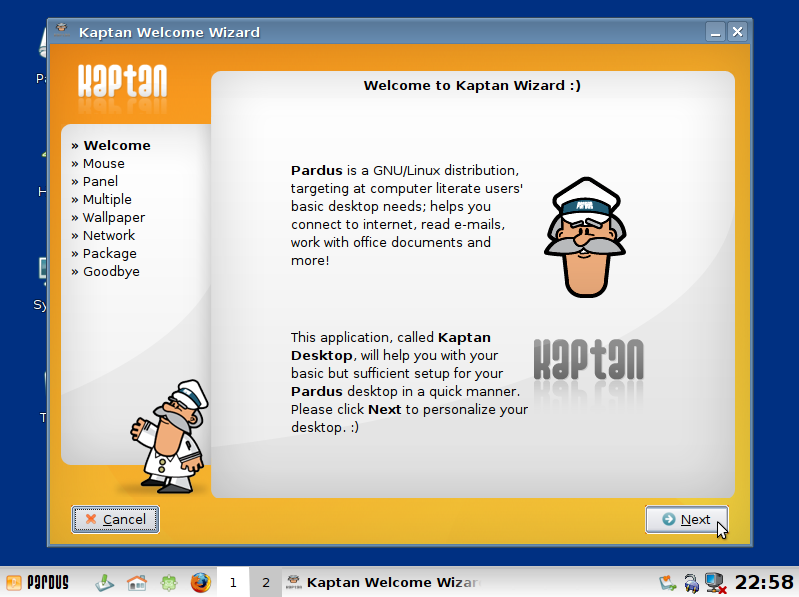 Right upon first login the user is greeted with a welcome wizard dubbed Kaptan. Kaptan helps you set up your mouse, display, look and feel preferences, and network and package settings. Each step gives a visual preview of changes, which are then applied as soon as Next is clicked. The Network step seems shaky. It integrates with Pardus' own custom networking applet, but it is slightly confusing to configure at first, which brings me to another point. Every step of Kaptan that changes a system setting, from networks to packages, will ask you for your user password. You can set it to remember your password, but it doesn't take effect for different controls. By the end of the wizard, you'll have typed in your password three or four times. This is more of a PolicyKit (a sudo-like mechanism) bug than Pardus' fault, but it is still an annoyance nonetheless. 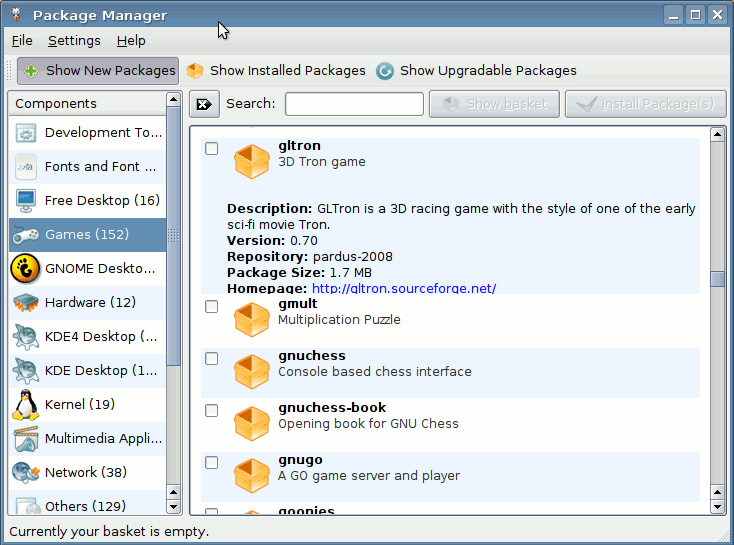 The desktop at first glance is a generic KDE desktop with the default Kaptan options. 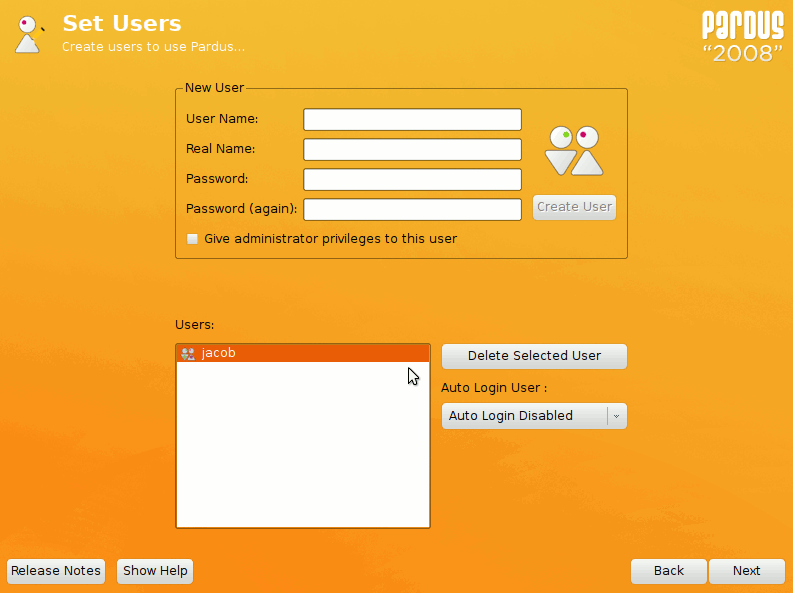 On the contrary, tweaking your desktop and system to your liking is not done with KControl, but with Pardus' own TASMA. It is similar to KControl in interface, but provides options in a less complicated manner. (Yes, I am one of those people who thinks KDE provides too many settings.) It's pretty simple to use, and includes everything from networking to desktop settings. There were also some pretty cool gems included, however, such as a GUI GRUB editor, and even a snapshot-style system restore panel. The latter definitely can be of use in those situations where you know you've messed up and just want to hit "Undo." TASMA, like Kaptan, also heavily integrates with PolicyKit for providing access control in settings for defining who can change what. This is a plus, but is also the same annoyance seen in Kaptan: Every time you change a system setting, you have to type in your password. Again, I'm sure that as PolicyKit develops this won't be an issue, but for now, it's a bugger. You won't find apt, yum, or emerge here. Instead, you'll be greeted with PiSi, another custom Pardus application. PiSi is pretty straightforward to use, and already has a good amount of packages made for it. It works similar to apt or yum: Applications are fetched, along with dependencies, from a central repository. One thing I didn't find was the ability to add a third-party repository. But for being written in Python, PiSi operates quickly with installations. Pardus 2008, to a green user, is your average desktop environment. Many of the gems of the system lie under the hood in utilities like TASMA and PiSi. It's an easy system to get started with, but has some odd quirks such as PolicyKit problems and the somewhat hidden root account. In the end, it's clear that a lot of effort went into making Pardus a usable desktop for anyone. If you haven't already, go check it out.